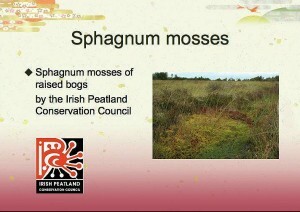 Without Sphagnum mosses there would be no bogs in Ireland. 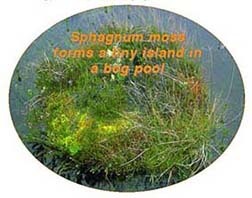 Bogs have a living surface which is made of a carpet of Sphagnum mosses. This is floating on a thick layer of partly rotted plant material that is soaking wet. This is why when you walk across the surface of a bog it feels bouncy. The carpet of Sphagnum mosses is not flat. Some Sphagnum mosses grow tightly packed together to form hummocks or cushions. These can be up to 1m high on the bog and can be chocolate brown or orange in colour. Scientists have counted 50,000 Sphagnum plants in a hummock measuring one square metre. Others form loose mats in colours of pink, red, copper and yellow. Still others grow as single plants surrounded by water in bog pools. These ones are bright green. All of the larger plants on the bog are growing on the Sphagnum moss. Some plants such as the Heathers grow on the hummocks of Sphagnum and have to avoid loosing water in the summer when the bog dries out a little. Many-headed Bog Cotton grows in the bog pools amongst the Sphagnum. Their stems are filled with air channels which allows the plant to breathe under the water, rather like snorkling. 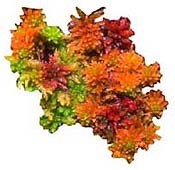 A single Sphagnum plant is very small but has an interesting structure. Attached to the stem are two types of branches – the spreading branches stick out and give the plant structure. The hanging branches are pressed to the stem and help to draw up water. Sphagnum mosses can hold up to 20 times their own weight in water. Water is trapped between plants in a hummock, but it is also stored inside the plant itself in special containers called cells. A huge number of tiny microscopic plants and animals live with Sphagnum mosses. 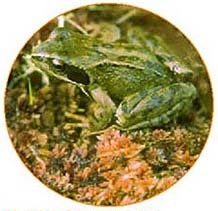 A few drops of water squeezed from wet Sphagnum contains hundreds of microscopic species such as desmids, diatoms, algae, cyanobacteria, amoebae, rhizopods, flagellates, ciliates, rotifers (wheel organisms), worms, nematodes (round worms), flat worms and heliozoans (sun animals). One scientist counted over 32,000 microscopic animals from a Sphagnum moss growing in a bog pool! The microscopic plant and animal life found in Sphagnum provides food for all other organisms living in the wet bog. These animals include pond skaters, dragonflies, damselflies, caddis flies, mosquitoes, midges, bloodworms, water boatmen, water beetles, water lice, and frogs. The web of wildlife is very special in a bogland. Thanks to campaigns run by IPCC, we are more aware of the need to protect Sphagnum moss and the bogs it forms. Sphagnum moss has many uses. In historic times it was used in bandages to soak up blood. Today people use a lot of Sphagnum moss in the garden. This is very bad news for the wildlife that depends on bog moss. If we recycle vegetable waste from the kitchen, cut grass and autumn leaves from the garden we can make COMPOST. This is much better for the garden than Sphagnum moss. 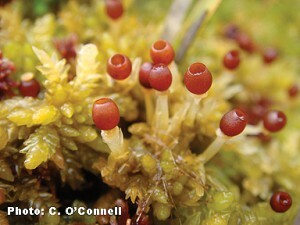 Sphagnum mosses grow from spores which are produced in fruiting bodies called capsules. When the spores are ripe, pressure builds up in the capsule until its lid is blown off, sending the spores shooting into the air. The spores grow into a tiny moss plant. As the tip or head of the plant grows upwards, the lower parts of the moss die and become peat. Some Sphagnum plants grow only a few mm each year. Others grow up to 10cm in a year!